I saw a news report the other day that said just 8 percent of the country has a great deal of confidence in Congress. I don’t blame them! The federal government shutdown is the perfect example why. In this update, I want to explain how things got where they are, and give you some updates that may be helpful if you’ve been directly affected by this. The best path forward is a long-term, bipartisan spending plan. That’s the way to protect the military and federal workers in our region from the partisan games that created this shutdown. Having said that, I voted for a short-term extension today because doing so ends this shutdown, and there’s finally a commitment from the Republican leadership in DC to abandon the wasteful, go-it-alone strategy we’ve seen for months in favor of a bipartisan approach. If you watch cable television, there were a lot of questions about the blame game. Was it the Schumer Shutdown or the Trump Shutdown? And at only three days, was all this much ado about nothing? To me, the right question is: how can we prevent this from happening again? Folks in DC simply have to do a better job of working together to solve problems. I continue to push for Congress to stop with the partisan bickering, the blame games, and the dysfunction that the American people are tired of, and get focused on responsible governing and making progress on behalf of the American people. It shouldn’t have taken a shutdown to get some bipartisan action going. Democrats and Republicans both agree that something should be done to provide a longer-term approach to budgeting. They largely agree on the importance of ensuring that Dreamers are not at risk of deportation. They largely agree on the importance of funding the Children’s Health Insurance Program which was thankfully extended for six years in the bill that just passed. The failure to take action on issues on which the bulk of your representatives can agree--the catering to the extreme rather than trying to actually get something passed--has led the current House majority to simply punt. To keep kicking the can. I tried to explain this to my daughter, Sophie, who is in 6th grade. 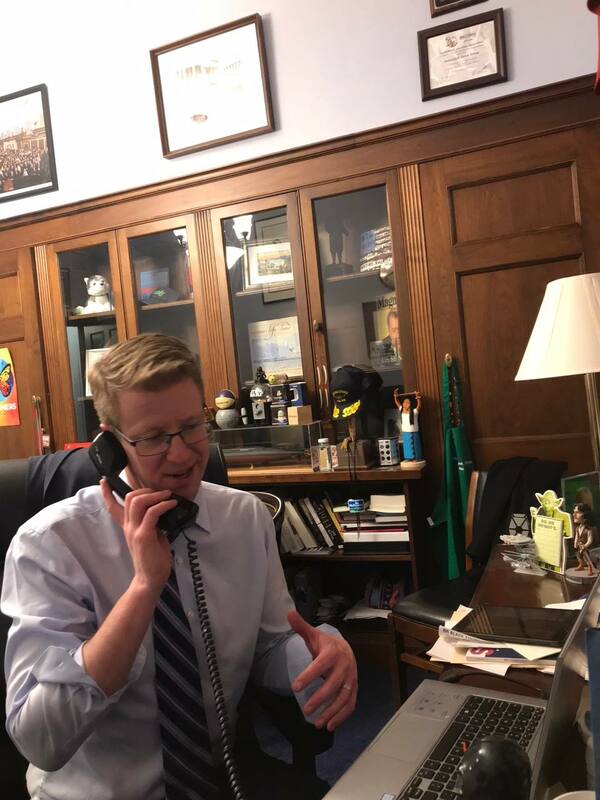 Here’s what I told her: Congress had a lot of undone homework--from passing a long-term spending bill to dealing with natural disasters to reauthorizing the Children’s Health Insurance Program to helping Dreamers to responding to the opioid crisis. For months, rather than getting it together and getting these assignments done, Congress has asked for extensions. Unfortunately, those extensions come at a cost. As I shared with folks on my telephone town hall last week, it comes at a cost to our military and to other federal agencies. It creates uncertainty. No successful business would function this way. Sometimes in this job you have to hold your nose and vote yes, and sometimes you have to hold your nose and vote no. While I do not like another extension on the undone homework, I’m willing to vote for one now because I finally see a commitment to some real negotiations--while government is open--and an opportunity for some constructive, bipartisan solutions. At the end of the day, I stand with Naval Base Kitsap, the employees at the Puget Sound Naval Shipyard, the Park Rangers at Olympic National Park, the folks at the Forest Service managing our forests, and all the other federal workers in our region who depend on a long-term budget to do their jobs, and who shouldn’t have to worry about whether or not the government will shut down again. We need a long-term plan for them, but they shouldn’t be held hostage every time our government’s leaders don’t want to work in a bipartisan way. I’m glad the message got through to Mitch McConnell and Paul Ryan, and I’m glad to see them commit to working to find some common ground. I work for you, and so does my team. We have extended office hours today in Bremerton and Tacoma in order to help seniors, shipyard workers, and others impacted by this situation. We’ll be open until 7pm tonight to work for you. Give us a call if you need some assistance or you simply want to vent. I can assure you, I’m right there with you. OK...that’s it for now. Keep an eye out for my future newsletters to see if the House and Senate leadership keep their promises. Know that I’ll be holding them to their word. As always, it is a privilege to serve you.